In an effort to catch up on some events that have happened over the past few months, I’m going to do more writing and blog posting now that my fingers are working better than they have for awhile. But for now, it’s going to be all about tonight’s dinner. Enchiladas, to be exact. I love to cook. I love to feed people. I love to fix food and have someone eat it. I’ve always thought I might have had some Italian mother in my ancestry or something. Now before you go all politically-correct on me and suggest that I’m being politically incorrect, let me just say that I mean no disrespect to anyone, especially to anyone who’s a real Italian mother. I was once married to a man who was part of a big Italian family and every time we had a family get-together, like Thanksgiving, summer picnic or whatever, the mothers in the family all cooked amazing food, and huge amounts of it, and then spent the entire time we were all together trying to get us all to eat more food. That’s my only reference and the only thing I have to go by when I say I think I must have had some Italian mother in my background. Now back to the food and cooking and eating and feeding people. But first, another story: I’m no longer allowed to bring macaroni salad to our current family get-togethers because I once brought a giant (I mean gigantic) macaroni salad to a backyard barbecue at my son’s house – and I’ve never heard the end of it. I think there were only five or six of us at this afternoon picnic but I guess I made my normal-sized salad that no doubt would have fed 30 people, maybe more. It’s probably been 8 or 10 years since that backyard event with the amazing, huge, very tasty pasta salad but I still hear about it. And not in a good way, if you know what I mean. Oh, the salad itself was super yummy and all that, but it was the quantity that apparently blew everyone out of the water. And that’s why I’m not allowed to bring macaroni salad to family events anymore. So yes, I like to cook and I like to eat and I like to feed people. 1 can of Las Palmas Salsa para Enchiladas, better known to us gringos as mild red enchilada sauce. Any brand is probably fine; my favorite is Las Palmas. Place half the can of enchilada sauce in a skillet; heat up but don’t bring to boil. Heat the corn tortillas, six at a time, by wrapping a damp paper towel around them and placing in a microwave for one minute on high. Place all the ingredients on the counter in such as way as to make an assembly line for putting together the enchiladas. My own assembly line looked like this (sorry, I don’t have a photo) – from left to right: enchilada filling ingredients, baking dish, skillet with hot enchilada sauce, stack of warm corn tortillas. In a 9×13 glass baking pan, spread a spoonful of the enchilada sauce. Now, assemble the enchiladas. With your right hand, take a tortilla and dip it into the sauce, covering both sides of the tortilla. Transfer to the baking dish and fill the center of the tortilla with desired ingredients. Roll the tortilla around the filling and place it “seam-side” down. Repeat with the remaining tortillas. Pour the remaining sauce over the top of the enchiladas. Sprinkle cheese on top of the sauce, along with any left-over bits of onions, olives or chiles. Cover with foil and bake in oven for 20-30 minutes, removing the foil during the last 5-10 minutes. Remove from the oven and let set for 5 minutes before serving. 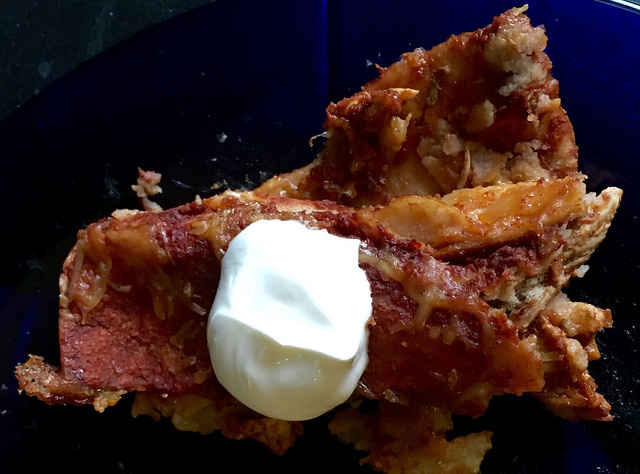 It’s super delicious topped with a dollop of sour cream or Mexican crema. Cheese and chicken enchiladas – ready to bake! 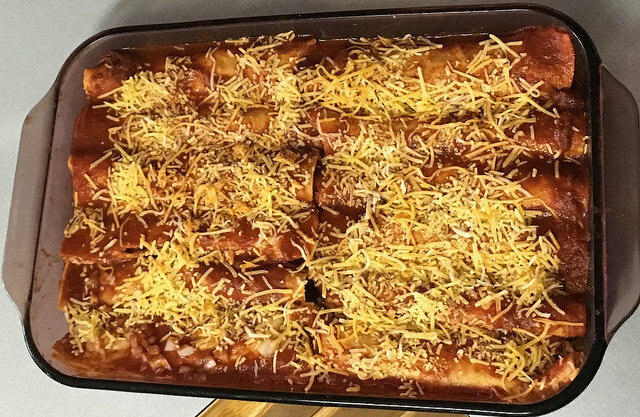 Let me know if you decide to make the enchiladas; I’d love to come over and join you in eating them! Lois June 10, 2016 Now What? ← A Big Happy Six! My first husband was Italian (mobster) and HE loved to cook (Oregano Oregano Oregano) ! My second husband was Swiss (lover of everyone) and HE loved to cook. And now Dan (civil war re-enactor and civil war history buff is Irish and HE loves to cook ! 3 out of 3 aint’ bad. Hahahahaha . . . I hope your family cuts you some slack. Leftovers can always be shared so the guests have food to take home! Haha! Nancy, I think you’ve scored big time! Good for you!